The heart of LENA HENKE’s An Idea of Late German Sculpture To the People of New York exhibition at the Kunsthalle Zürich is a machine. With a winch set into the walls of the exhibition space, large pieces of chain mail are pulled through the room. However, this material made of aluminium rings does not protect virile bodies in close combat. Instead, it glides across the surfaces of sculptures, sometimes setting them in motion. The armour does not protect the surfaces from the outside, and instead opens up the possibility of a cool touch, which it itself paradoxically performs. The exhibition is divided into two extremes: the archive and a topological machine that activates the space. Both poles are contrary to the normal function of the institution, which otherwise shows objects but neither makes it possible to use them nor to see their archiving. The sculptures shown twice in the exhibition attest to precisely this contrast. On one side, they seem abstract: peculiar postmodern mishaps between Surrealism and Minimal Art. 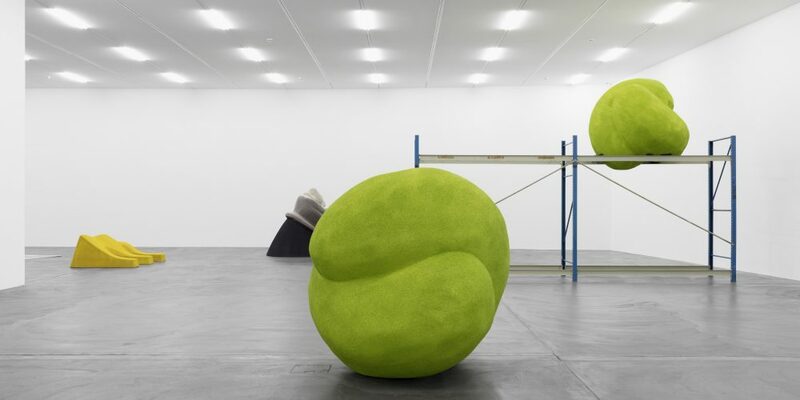 HENKE’s approach does not simply destroy the ideologies of modernism: it induces a new, polymorphically perverse afterlife for sculpture. Outset Germany_Switzerland supported this exhibition and also received HENKE’s work Totem and Tabu, 2018, which will be donated to a public institution.